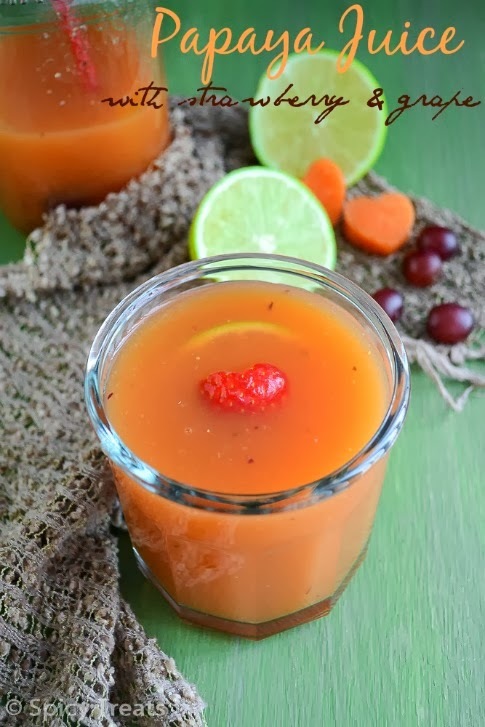 For Vegan Thursday today I am sharing a simple but healthy Juice Recipe using Papaya, Grape and Strawberry. We take Papaya regularly and for me its a compulsory since Papaya has tons of nutritional benefits - good for Eyes, skin and the high content Anti oxidants helps to reduce cholesterol and also controls premature ageing, the high fiber and low calorie nature helps in weight loss and a natural blood purifier and body cleanser. So without fail at least once in a month I take papaya. This time the Papaya was bit over ripe but mostly i like the perfectly ripe fruits not the over ripe ones except the Mangoes. 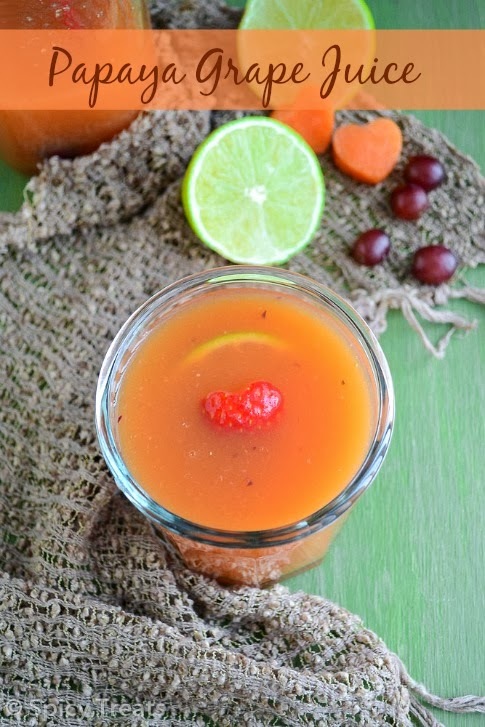 So again the over ripe Papaya turned into this delicious drink along with some grape, strawberry and with the hint of lemon. Over all a power packed drink with tons of benefits and filling drink that is perfect for breakfast or take it as a snack when you are on diet or if you need a healthy, low calorie & filling snack. As all my fruits were well ripe and sweet i added only 1/2 tsp to balance the sweet & sour. Wash all the fruits thoroughly..drain completely and use. Peel papaya, cut and scoop out the seeds portion and cut the thick pulp into chunks. Now take papaya chunks, grape, strawberry, lemon juice, sugar in a blender and pulse it for few seconds. Then add water and blend it to a fine smoothie. After that using a mesh strainer or juice filter, filter the juice and adjust water or sugar to taste. Transfer to the serving glasses top it with some crushed ice and serve immediately. 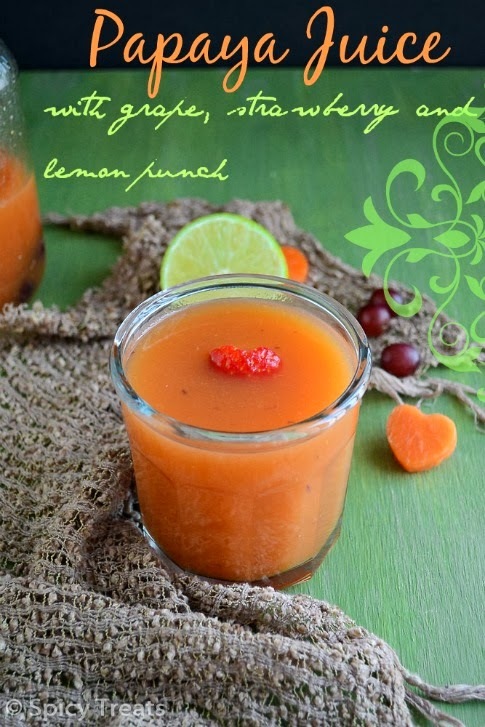 You can also make it a plain Papaya Juice and skip grape and strawberry. For a non-vegan version you can also use honey instead of sugar. Add water as per your taste but do not dilute it too thin. This recipe is off to Priya's Vegan Thursday Event. Healthy juice n wonderful info abt papaya Sangee!!! 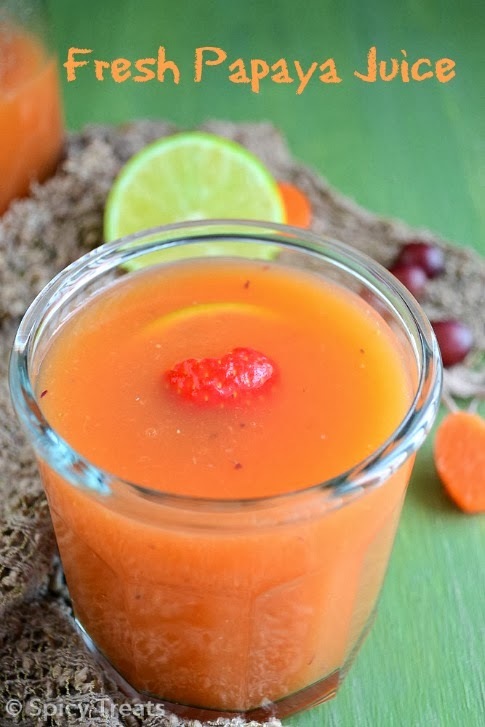 im nt a huge fan of papaya.. but addition of lemon,grapes n other fruits is motivating me enough to try out this juice.. it looks so refreshing..
Lovely color:) Good for eyes! Healthy juice...... good for health !